Why build offsite? The simple answer to this question is – because the United Kingdom can’t achieve its construction volumes without using alternative methods of building. Currently around 90% of new homes in England and Wales are built using traditional masonry materials – brick and block. The story is a little different in the commercial sector where OSM (offsite manufacturing) is becoming standard practice for some large players and significant investments are being made into these processes. There are two types of OSM – volumetric (modular) and panelized (or smart modular). Thanks to the development of BIM, both can be highly tailored in design and both are built to last – in the case of light gauge steel, in excess of 200 years. The benefits of OSM can be realized across every type of construction project – student accommodation, residential, education, healthcare. 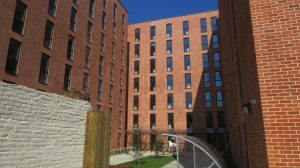 For example, a light gauge steel system was used at The University of Derby’s new Cathedral Road student accommodation where a 350-bed, £14m seven story structure was required for September 2016 intake. The contractor was originally heading down a traditional build route but time constraints simply didn’t allow. Using OSM, a 20-week build plan could slot in neatly and the development was completed two months ahead of schedule. And at The Old Oak in Ealing, North London, seven story and nine story apartment buildings were built using OSM and positioned next to each other on a transfer platform. Weatherproofing was applied to specific floors of the structure to maximize the speed of build and enable other trades to maintain a good pace on site. The building was complete within 21 weeks and is believed to be the single largest steel structure of its kind in the UK.